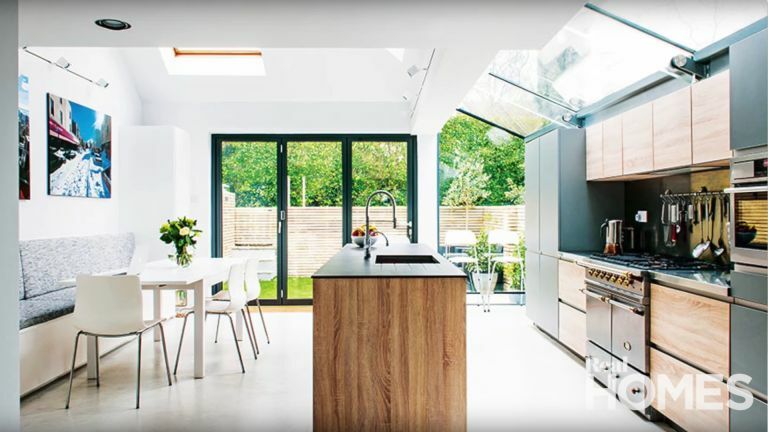 Planning a new kitchen extension? Get everything from the kitchen extension's design to the costing and budgeting of the kitchen addition with these expert tips. Try to find reliable builders who have been recommended to you by people you trust. Reputation is everything. Research them online and follow up references from other satisfied customers who have had similar work done. View recommended tradespeople websites to find individuals and firms that have been vetted to a high standard, and have had insurance, qualifications and professional memberships verified, with customer scores. The best time to plan a new kitchen lighting scheme is before you start your project, not after. Get it wrong and your space can end up feeling one-dimensional and impractical for the multitude of functions it will be used for. Avoid a solid grid of downlights evenly spread across the ceiling; work out which fittings and positions will be best to achieve what you want. The key to a successful kitchen lighting scheme is to get the temperature of LEDs right, as they have a reputation for being too cold. The main colour temperature to work with is 2,700K. A lot of kitchen manufacturers go for fittings with a much higher number Kelvin, which give off a really cool white colour. This is fine for daylight, but you need something warmer for an evening environment. Design independent lighting circuits for separate kitchen, dining and living zones in an open-plan layout. Use two or three different layers of lighting within each zone (ambient, task and mood lighting circuits) for function and atmosphere, ideally with dimmable controls. Thinking outside the box when it comes to cabinetry could give you a unique design. For example, wall cabinets don’t have to sit side-by-side — choose different shapes and sizes in an interesting composition. Or, consider ways to add personality to your kitchen, whether structurally or in design details. To avoid costs spiralling, try to get the job done on a fixed-price basis in case the work takes longer than expected. You’ll need to avoid making any changes or additions, though — or ensure you agree the extra cost in full before giving the go-ahead on the work. Find out how to cut the cost of your extension and how to cut the cost of a new kitchen. If extending your kitchen, bring in light from as many different directions as possible, including from above using rooflights. The main drawback of rooflights, however, is privacy, as if the opening is too big, it may be hard to keep the space private if you’re overlooked from above. The main advantage of choosing bi-fold doors over French doors is that they widen the aperture. When the doors are fully pulled back this opens up the living space. Bi-fold doors can open inwards or outwards depending on the space. This allows greater flexibility in changing units in the future without having to replace your entire kitchen flooring. Although some might say you are buying flooring that is essentially covered and unseen, you will save in the long term. This is because the installer does not have to make cuts all around the contour of the cabinets and, therefore, their labour costs are lower. The uniform-level floor also makes the kitchen installation that much easier. If space allows, an open plan living-kitchen, including a dining area and ideally a seating zone, is ideal. But if space is tight, a split-level kitchen island creates a central gathering point; one side is dedicated to preparation, the other to relaxing. A peninsula is ideal if there isn’t room for an island, as it takes up less space but still creates a multifunctional and social hub of the home. Kitchens need to retain their functionality, so focus on how the kitchen design works first and, only once this is right, think about the style. It is crucial to think through the circulation and look at how people will move to and from, and within the space itself. Where a kitchen opens out onto the garden, for example, a common mistake is for this to be the main way in and out of the space. If you are getting hot dishes out of your oven, the last thing you want is kids rushing in and out of the garden across your path. Get more than just a mobile number — you need a landline number, office address and trade-association membership details. Never pay upfront for building work. Knowing your rights when buying a new kitchen is vital. If you have savings, consider using these first to buy your kitchen before borrowing any money. However, while it’s best to budget and save up before you make a purchase, it’s worth putting a portion of the total amount on a credit card. This is because if you buy anything that costs between £100 and £30,000 using a credit card, then the card firm is jointly liable with the supplier if things go wrong. This applies even if you pay just a small portion of the total on a credit card. 11. Should you appoint an interior designer? Seeking interior design advice for kitchens is always time well-spent and most interior designers will offer a complimentary first meeting. This is your opportunity to make sure that you will be able to work together. Use this time to see whether they listen to your ideas. Do they relate to you in a manner that resonates with you? If they disagree with your proposals, do they adequately explain why it won’t work, or are you left feeling overlooked and unimportant? If you need further reassurance, you can ask for written recommendations from, or talk to, previous clients. Take care to choose a really experienced, creative designer, especially if you have strong ideas of your own. Your first impression of an interior designer is often their online portfolio. Do you like what you see? Can you envisage their style in your home? The same goes when you're appointing a kitchen designer. A great area to save money on is cabinets. Think about including an open wall space with shelving rather than choosing all wall units. This will create a light, modern look, too. Find out how to create a stylish kitchen on a budget. When it comes to installing a cooker, be aware that you need to hire a qualified electrician or gas-safe-registered engineer to install the majority of products. However, there are some electric ovens and hobs available that come with a 13-amp plug, which means they can simply be plugged in and are ready to use straight away. Always check before buying. And make your budget clear to your designer at the start. If finances are limited, an off-the-peg kitchen can be customised for a bespoke look. The layout is a major factor in open-plan kitchen diner and living spaces and family kitchens — you need to think carefully about the design and aesthetic of this style of kitchen, as the units will always be on view. Opt for integrated appliances, unless you’re using them for impact, such as a range cooker. If possible locate the washer/dryer in a utility room and select an ultra-quiet dishwasher. Get the space right based on your living requirements, then design the optimum kitchen furniture layout around this. You may need two designers — one to deal with the architectural design of the space and then a kitchen layout specialist: few designers excel in both areas. Spend a little more on the parts of your kitchen that are on display and that you use every day, such as hot water taps or kitchen worktops. Delayed start dates or drawn-out works can have a major knock-on effect on any other works, so agree a start date and estimated finish date, although be aware that trades can be delayed by factors outside their control, and that any changes you make as the work progresses are likely to slow the job down. It’s essential to choose the model and position of all appliances before first-fix electrics and plumbing work starts. This ensures plumbing connections (water and waste), vents and ducts (for extraction) and power are in the right place before you plaster or lay flooring. If you are employing an architect, be prepared to accept their ideas as well as your own — a good architect will be able to take your best ones and combine them with their own expertise to make a great result. Don’t be too concerned if the first sketches aren’t exactly what you had in mind; often the best way to communicate proposed spaces is in 3D. Ask your architect if they can produce photo realistic rendered views to provide complete design clarity. Don’t be afraid to relocate your kitchen completely — but check options with your designer or plumber first.